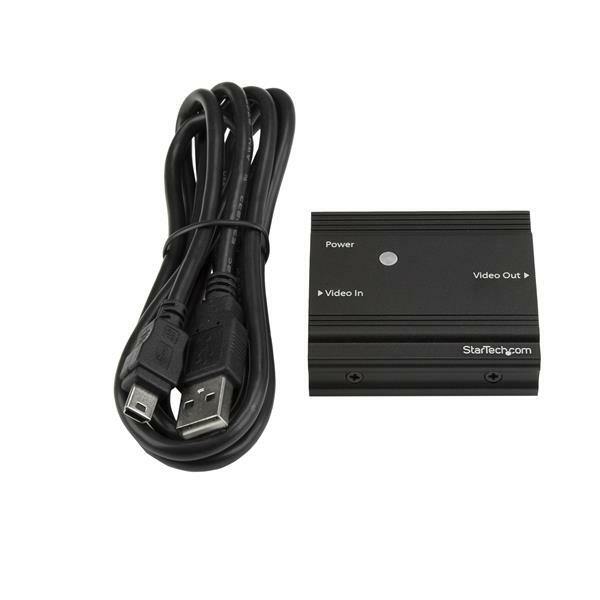 This 4K HDMI® signal booster lets you increase the signal strength of your HDMI video source so it can travel greater distances using standard HDMI cables. You can achieve resolutions up to 4K at 60Hz at distances of up to 30 ft. (10 m), and depending on your desired resolution, the booster supports distances up to 115 ft. (35 m) away at 1080p 60Hz resolution. To install the booster, place it between two HDMI cables. Reference the table below for supported resolutions and cable lengths. When you’re extending HDMI over distances using standard video cabling, higher resolutions from your HDMI 2.0 devices can become unavailable after a few feet. 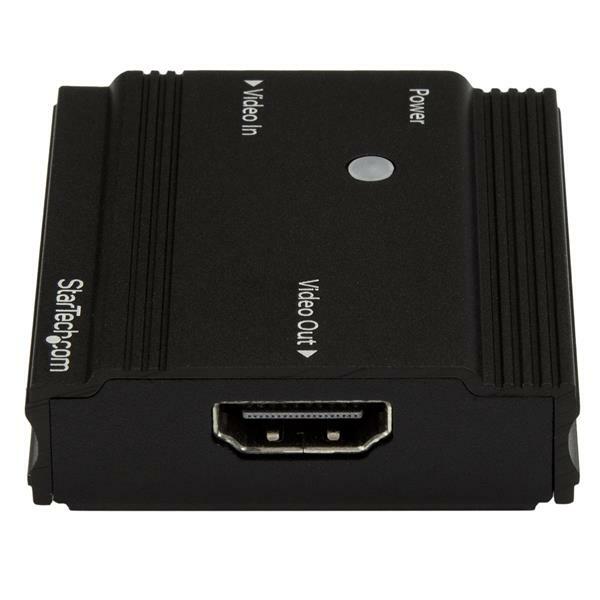 Using this HDMI signal booster ensures that HDMI 2.0 resolutions up to UHD 4K at 60Hz are available even at distances up to 30 ft. (10 m). You can achieve even longer distances at lower resolutions -- up to 4K at 30Hz, at up to 82 ft. (25 m), and 1080p at 60Hz at up to 115 ft. (35 m). With its small form factor design and no external power adapter, the HDMI booster is easy to hide, for a discreet installation. 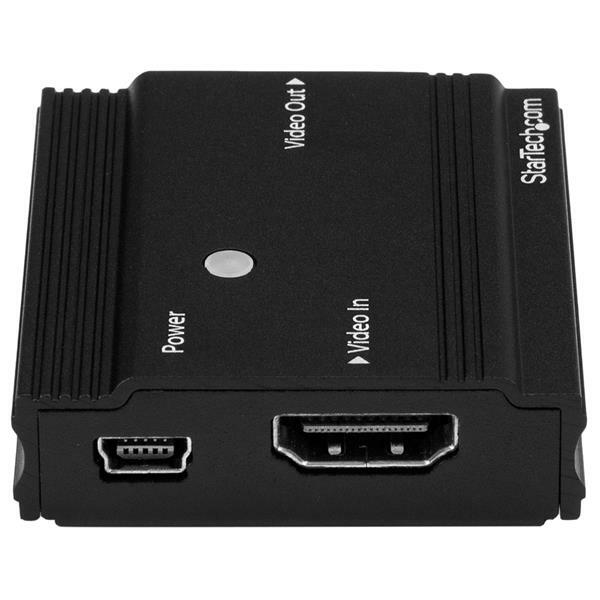 By extending your video signal using standard HDMI cables, the 4K booster is a cost-effective alternative to more expensive extension systems that require the installation of a CAT5 or CAT6 cabling infrastructure. The booster makes it easy to adjust your HDMI signal strength based on the distance of your cables, with equalization adjustment buttons. This means that you can adjust the amplification of your HDMI signal, to ensure your signal will be flawless. Support for a variety of extension distances makes the booster perfect for multi-device deployment across large institutions, such as boardrooms in corporate offices, classrooms in schools, or waiting rooms in hospitals, as these applications may require varied distances in different rooms. Note: To achieve resolutions up to 4K60, your video source, display and cabling must support HDMI 2.0. 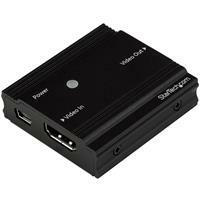 The HDBOOST4K is TAA compliant and backed by a 2-year StarTech.com warranty with free lifetime technical support.